Writers and Thinkers Welcome! Alternate-History, Future-Concepts and Sci-Fi await! President Kennedy, in his second term, sent a perfunctory congratulatory note to an aging Adolf Hitler. “You have your system of government, and we have ours – but we can agree to celebrate the achievement of German science.” It was an empty gesture. The nation’s economy was three-quarters of its former size, and any hope the United States had of becoming a world power again had been crushed in March of 1944. In the Pacific, the Japanese had consolidated their gains in Hawai’I and Alaska – while Hawai’i became a Japanese prefecture in 1948, Alaska became a state in 1961 – but the Aleutian chain was not on the U.S. map – it belonged to Japan; their air and naval bases there constantly patrolled the west coast of the U.S., assisting their German allies with the task of assuring a ‘peaceful America’. Hitler’s decision to leave North America alone after the war was based on two realities – first, he hadn’t the personnel to occupy the region; second, the advice of Goering and Goebbels proved true – render the Americans impotent, and the problem of a resurgent America is solved – in Goebbels’ words, “They were content to let us take Europe while they sat behind their borders – what else will change, really?” In the end, history has proven him correct. The occasional refugee which manages to leave Europe and come to North America through the neutral nations in Africa and South America have told chilling stories — almost-unbelieveable tales of population resettlement, largely along ethnic lines — however, these stories have never been substantiated, and are largely dismissed. What is really happening in Europe today is the subject of modest speculation on an intellectual level – but the U.S. can take no concrete action, even if there were sufficient interest. The cost of isolationism – with its resulting loss of trade — was high. Food shortages, unemployment and crime were chronic in America. The population had actually decreased to 1880’s levels, and some diseases which were on the brink of being eradicated in America in the 1930’s had made a resurgence. The United States military was a fraction of even its 1940 size. U.S. naval bases were restricted to home-waters; since the war, U.S. shipyards had produced nothing larger than a destroyer. The U.S. Navy, in spite of repeated requests by the Navy Department to upgrade the fleet, still has several aging battleships in its inventory, although the oldest of them, the USS Arizona, had been retired in 1955. Today, it sits, along with many other ships, in the mothball fleet in Bremerton, Washington. Eugen Sanger (1905-1964) was a driven man whose thesis in college on the theories of space flight were determined to be too fanciful. He caught the eye of the Reich Aviation Ministry, which requested his assistance in the creation of a bomber which could reach America. Sanger’s work on the project, actually conducted in Trauen, was instrumental in creating technologies and physical theories which later found their way into the X-15 and the Space Shuttle. His discoveries regarding the twin concepts of ‘body lift’ (using the entire body of an aircraft to create lift), and ‘compression lift’ (using the shockwave of a supersonic flight to literally ‘carry’ a craft in the stratosphere) were instrumental in the construction of the Concorde, the XB-70 “Valkyrie”, and several other aircraft. In reality, Sanger’s work was cancelled, having been deemed too expensive to pursue after the 1941 invasion of the Soviet Union. He worked on other projects, but never pursued the “Silverbird” beyond that point. The theory of a suborbital bomber like the ‘Silverbird’ was sound. 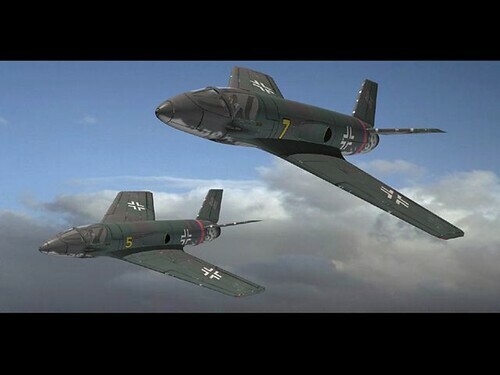 Although the artists’ renderings were of a design which would not have worked (I mentioned the wings and tail-section in my counterfactual), these were well within the scope and technology of the time to find and ‘fix’. In the counterfactual, I did so, even though the renderings show a twin-tailed aircraft with fixed wings. Werner Heisenberg (1901-1976) was a physicist and protégé of Niels Bohr and Otto Hahn. He was rapidly promoted within the structure of the Kaiser Wilhelm Institute from 1934 on, mainly due to the ‘brain drain’ experienced by Germany after their persecution of Jewish people, of which many were scientists, including Albert Einstein. While he discovered the theory and could have likely done so, the reasons why Heisenberg did not actually build an atomic weapon for Germany remains an unresolved mystery. Heisenberg’s participation in the German atomic-bomb project has been the subject of much speculation. It has been alternately proposed that Heisenberg either delayed his own work out of moral considerations, or did so from a lack of focus. In my counterfactual, I provided Heisenberg with the ‘ultimate manager’ – Eugen Sanger, to whom I gave total control over the bomb-project and the suborbital bomber. Dr. Hellmuth Walter (1900-1980) was a German physicist who applied his knowledge of liquids and gases to the construction of propulsion systems. Not stopping there, he also designed the series of what are known as “Walter boats” – the Type XXI, XXIII, and XXVI U-boats. Designed for primary operations underwater, they presaged both the Albacore and Nautilus designs post-WWII. The Type XXI was produced as stated in my counterfactual; segments were constructed and assembled in prefab-stations at shipyards at Kiel and Hamburg. There were, indeed, plans to launch V-1 ‘buzz bombs’ from the deck of the Type XXI when it went into production – creating, in effect, the first sea-launched cruise-missile (this was actually done by the U.S. Navy in 1946, under the “Loon” program). Walter’s propulsion system, which used a pure form of hydrogen peroxide as a catalyst to produce steam, was prone to spontaneous explosion if not constructed to some exacting specifications – which meant that it was never produced by Germany during wartime, although tests showed it to be as efficient as early submarine-based nuclear systems. He eventually emigrated to the United States and worked for an engineering firm before retiring. Adolf Galland (1912-1996) was perhaps Germany’s best-known and most-talented fighter pilot. He served in the Spanish Civil War prior to WWII; his trademark cigar and “Mickey Mouse” cartoon on his aircraft became well-known throughout Germany. Increasingly critical of the war effort and of Hitler, he was arrested in January of 1945 and put under house-arrest until March of 1945, when he was recalled to duty and put in command of an ME-262 (jet) fighter squadron, where he achieved a good measure of success, although too late to be of value to the Reich. Postwar, he was held as a prisoner for a time, then lectured on tactics and ran his own aviation consulting company until his death in 1996. Trauen is the current home of a branch office of the German space program. Sanger’s research was also conducted there (see above). I created the complex there in my counterfactual for some pretty good reasons – it’s remote; it’s sparsely-populated, and the counterpoint to the beauty of the region made for some good writing! Messerschmitt was a real aviation company in Germany, and was one of the most prolific designers of aircraft during World War II. 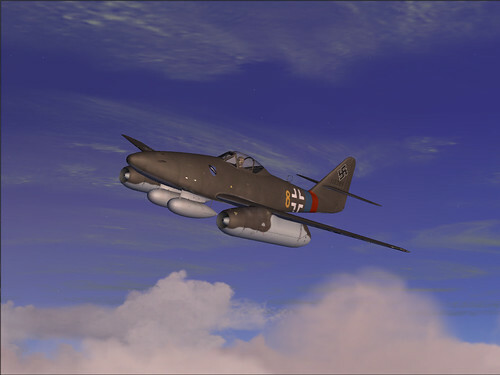 Their sometimes-futuristic designs led to the production of the world’s-first jet fighter, the ME-262. While the 262 did not see actual production due to National Socialist party interference until late 1944, its brief impact was so significant that Allied bombing raids were tasked with destroying all factories and airfields building and supporting them. The Messerchmitt ME-1112 – the fastest design of those created by the company – could have achieved speeds of 1,000KPH – if produced when designed in 1938, it could have altered the course of the war. (The other characters are a matter of public record. Lindbergh’s anti-Semitism, isolationism, and America First membership are also a matter of record, and are well defined in his wartime journals). Luft46 (Website) – Note: Artist’s renderings and artwork of German aircraft, including ‘Silbervogel’, are courtesy of this fine website, which was developed as a repository for information on German aviation research from the years 1932-1945. I want to thank you for the link for the artwork. I have been perusing the site for a good hour and have come away gobsmacked. The wide variety of designs that were being worked on along with some I know when to fruition really makes me wonder why the Germans lost the war. They had such superior technology. I know a lot had to do with Hitler’s incompetence and interference with the war effort, but given a few changes your scenario wouldn’t be too far fetched.